Is High-Resistance on an Elliptical Good for Upper Body Muscles? Moving an elliptical's handlebars provides an upper body workout. In the gym or home, an elliptical gives a knee-friendly, calorie-burning workout. Moving your feet in rhythmic motions, your glutes, quads and calves reap the elliptical's toning benefits; yet you may neglect the machines awkward handlebars all together. Grab on and move all four limbs as you increase the resistance, giving your delts and pecs a deeper workout. Check with your doctor first, especially if you have a chronic condition or illness. Elliptical trainers fit the limited on time but wanting a full-body workout niche. Multiple speed settings, incline adjustments and cross-country skiing-esque handlebars use many major muscle groups at once. From your thighs to your delts -- and even your abs, the elliptical tones your lower and upper muscles groups, and works your cardiovascular system. Of course, neglecting to use the elliptical's handlebars, or adjusting your machine's resistance settings, results in a weaker workout. Add high-resistance intervals to tone your chest and arms, while burning calories. While not marketed as a biceps-triceps-pecs-and-delts toner, the elliptical could be. Escalating the foot pedal's resistance makes the handlebars harder to move back and forth. If you want a ripped upper body, set your elliptical on a higher resistance. Just stick to intervals. High-resistance settings cause lactic acid build up -- a sign your body is engaged in high-intensity exercise. Instead of burning calorie making calories, you burn carbs. Too much lactic acid and you'll exhaust yourself. Because of this, high-resistances are not for slow-and-steady fat loss. 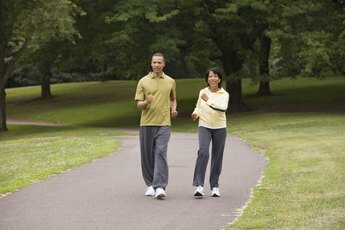 Stick to a low-resistance cardio workout to lose pounds. 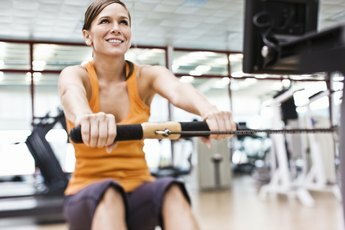 High-resistance settings on your elliptical are for two things -- building muscle and increasing endurance. Mixing the two -- through interval training -- builds muscle and burns excess fat. Zeroing in on your upper body doesn't require fancy, high-resistance elliptical exercises. The secret: Don't fall into temptation and let your legs do all the work; your arms won't see the benefit. Grab the handlebars and use your triceps and pecs to push them forward. As you pull the handlebars toward you, do so forcefully, using your lats and rhomboids -- back muscles -- and biceps. Stay focused, not letting that best seller or hit comedy miss-align your posture. Don't slouch off. Hunching over the consul prevents your muscles from working efficiently. Do not assume upping your elliptical's resistance will tone your upper body over night. Add strength exercises, as well, for a well-rounded upper body routine. Dumbbells and resistance bands are swell choices for building muscle, but they don't offer the cardio benefits of an elliptical trainer. If you have arthritic knees or osteoarthritis of the spine, be careful increasing the resistance. Elliptical trainers are easier on the joints than running on land or a treadmill, but don't push your body's resistance limit. If you feel pain, lower the resistance or stop. American Council on Exercise: An Elliptical Cross-Trainer on Three Wheels? 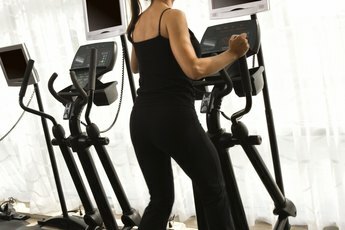 Does the Elliptical Cause Tight Calf Muscles? 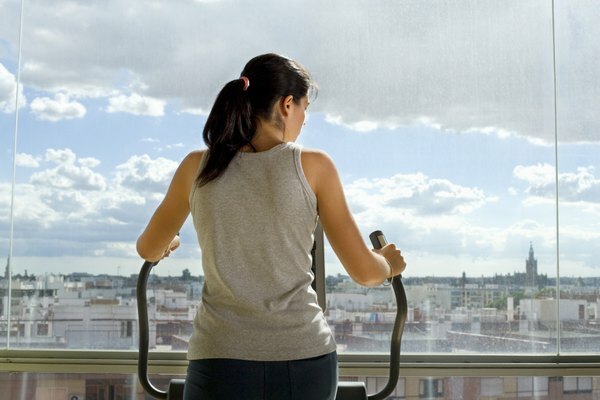 What Is Elliptical Gym Equipment?